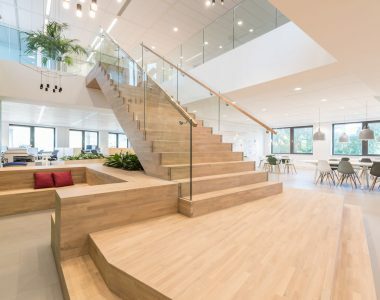 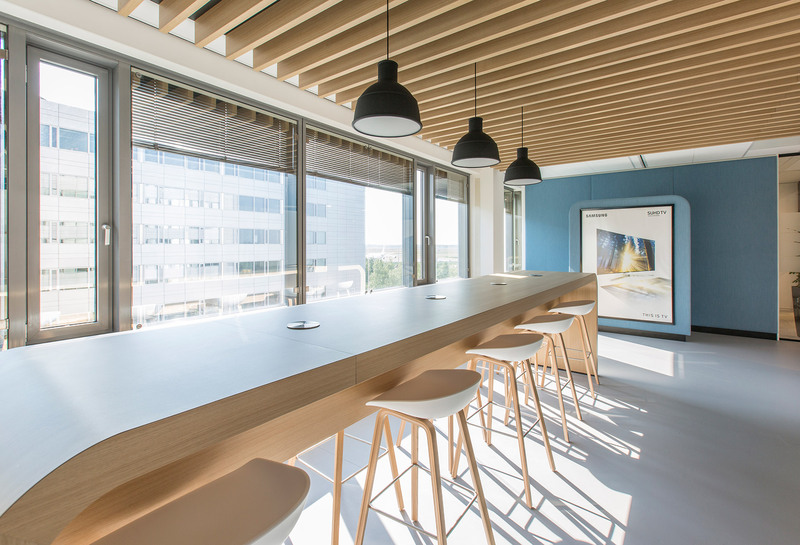 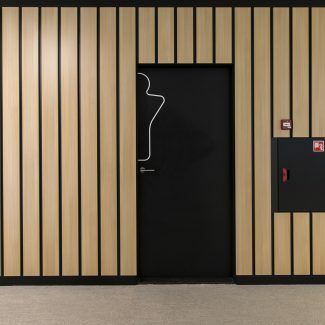 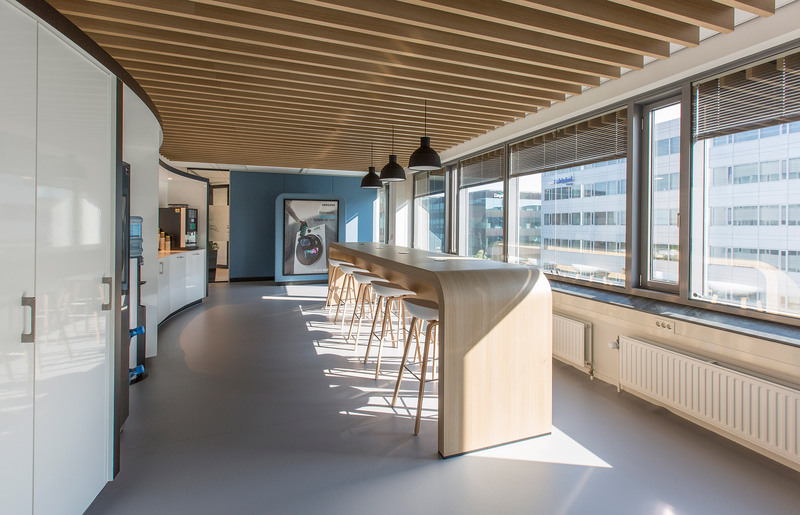 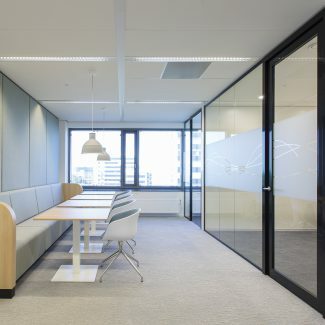 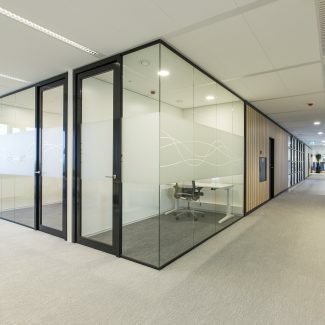 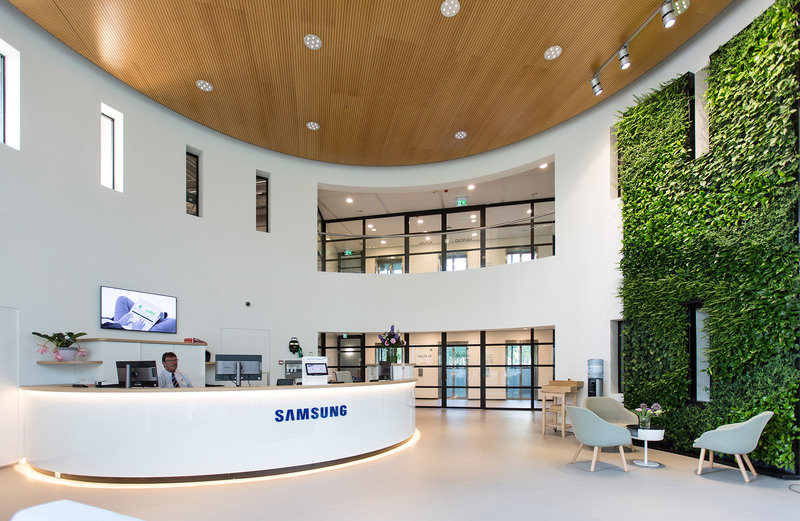 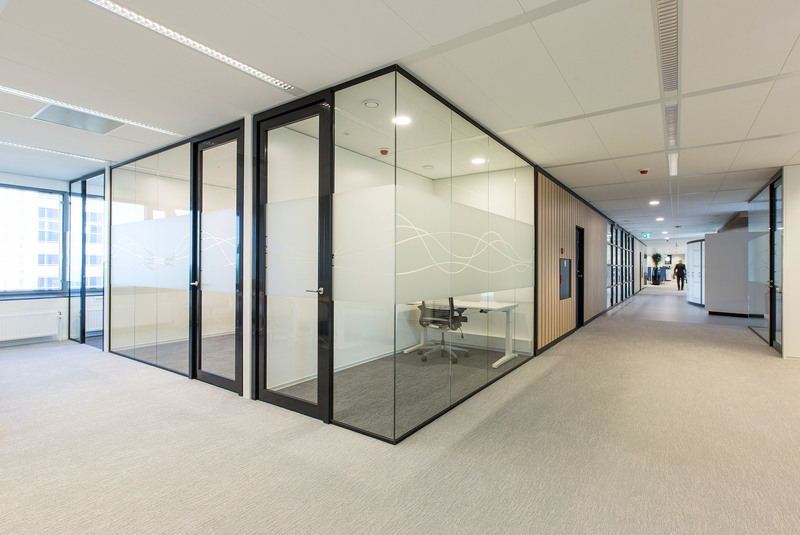 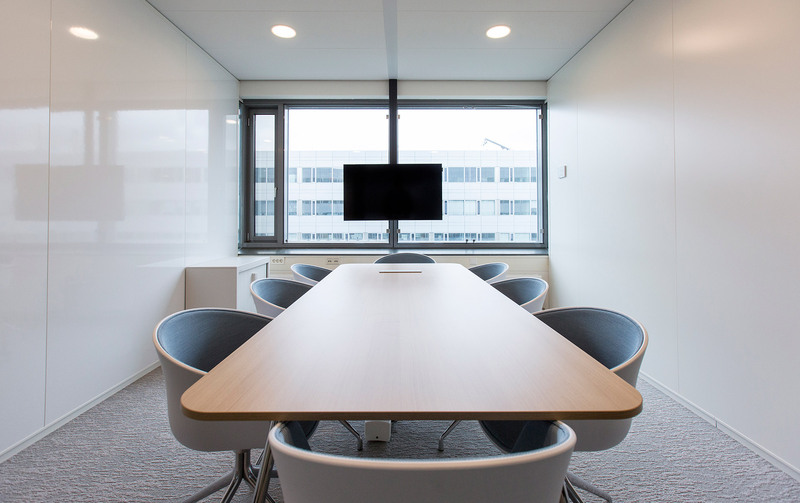 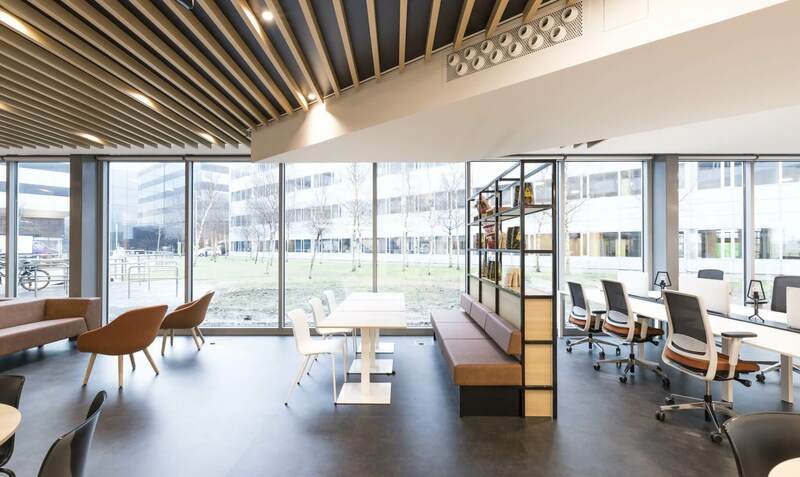 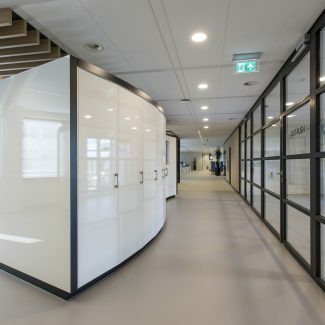 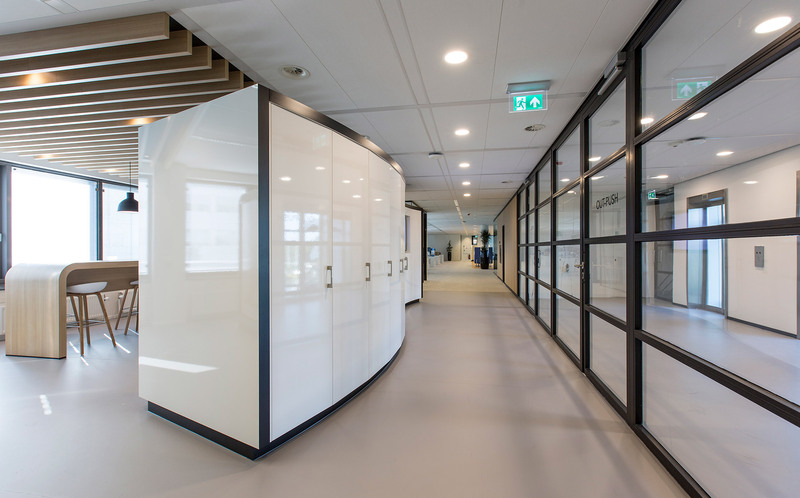 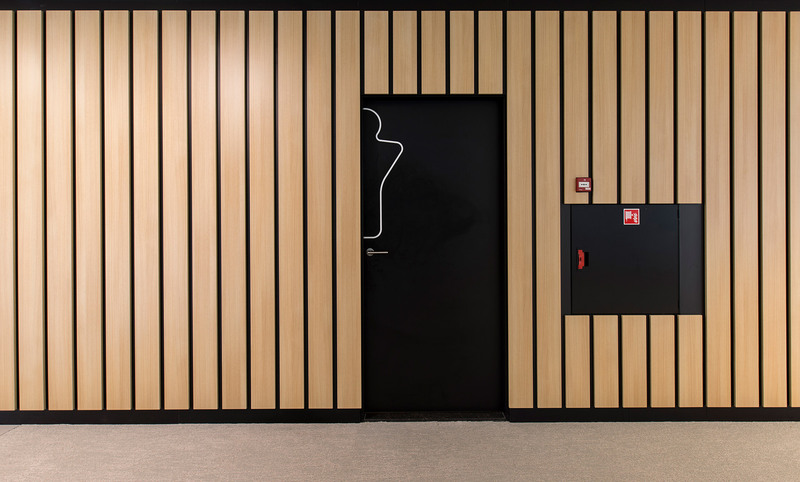 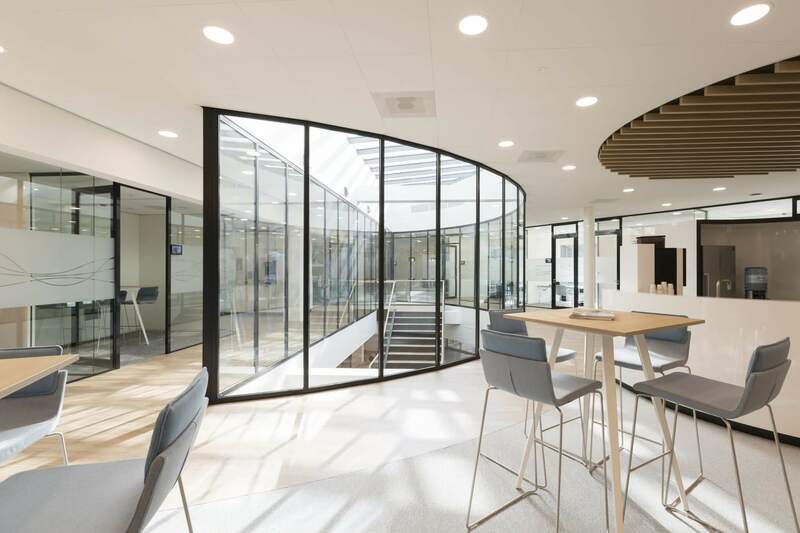 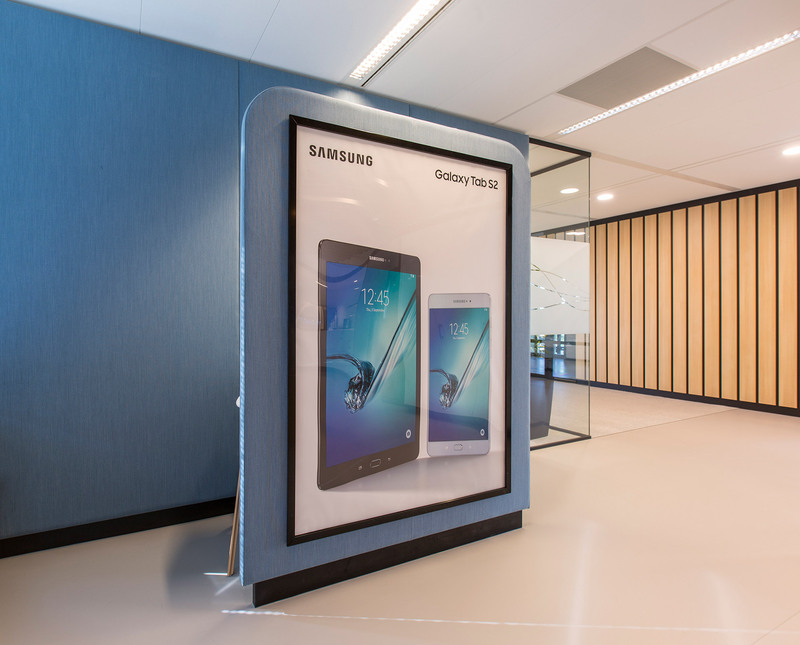 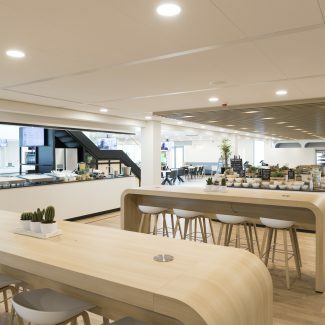 Tétris has designed and constructed the new office interior of Samsung at Schiphol in The Netherlands. 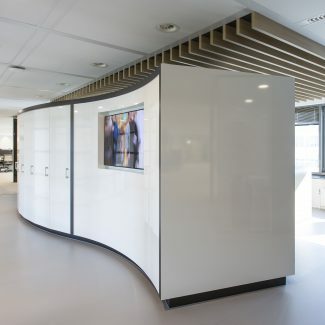 We fully constructed the reception desk, pantries, meeting rooms, gym, restaurant and meeting center. 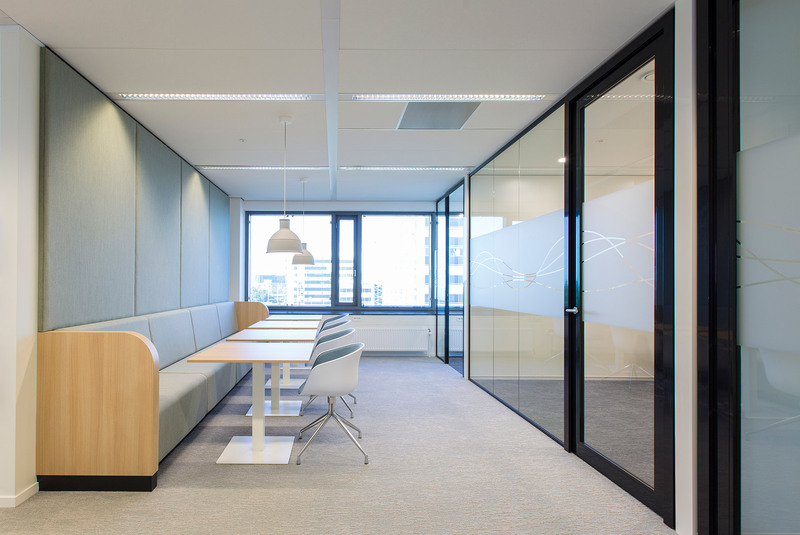 The biggest design challenge was to make a layout which stimulated collaboration between different departments. 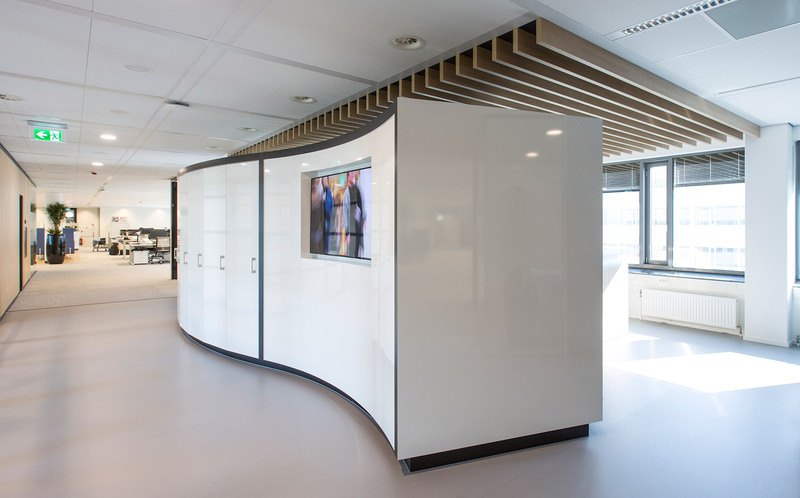 In order to achieve that, Tétris has devised different solutions. 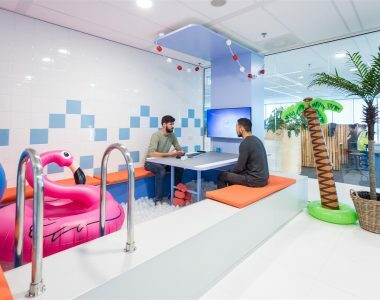 We have designed high and low traffic zones in the office. 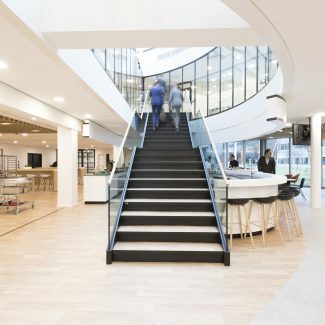 The high traffic zones are located in the middle of each floors where you find the pantries, office supplies and meeting rooms. 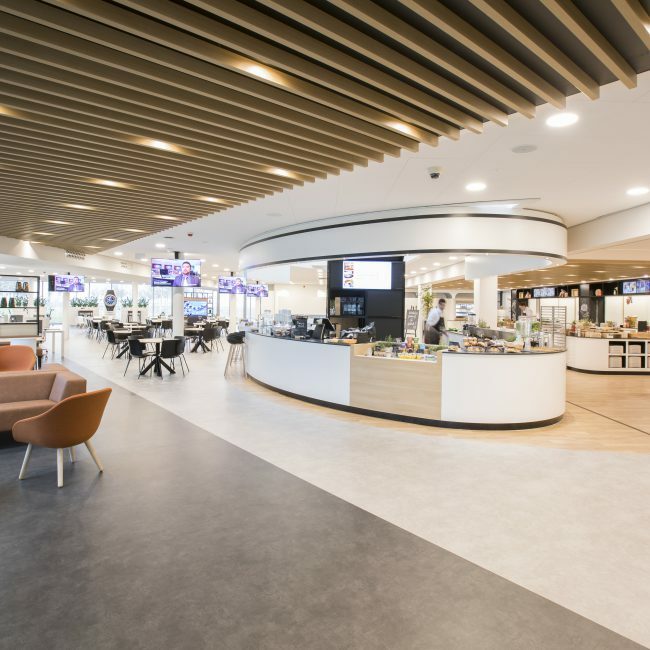 In addition, high traffic zones are made on the ground floor and first floor where the restaurant and meeting center are located. 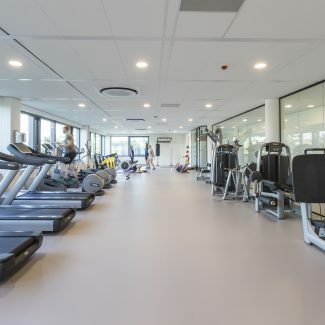 The high traffic zones are the areas whit a lot of activity. 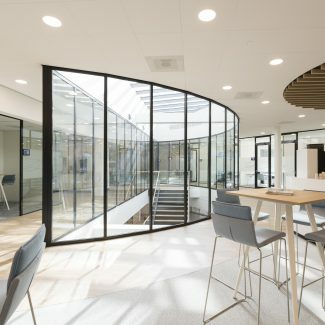 The low traffic zones are more in the rear end of the building where there are less facilities which results in a quieter surrounding so people are able to concentrate. 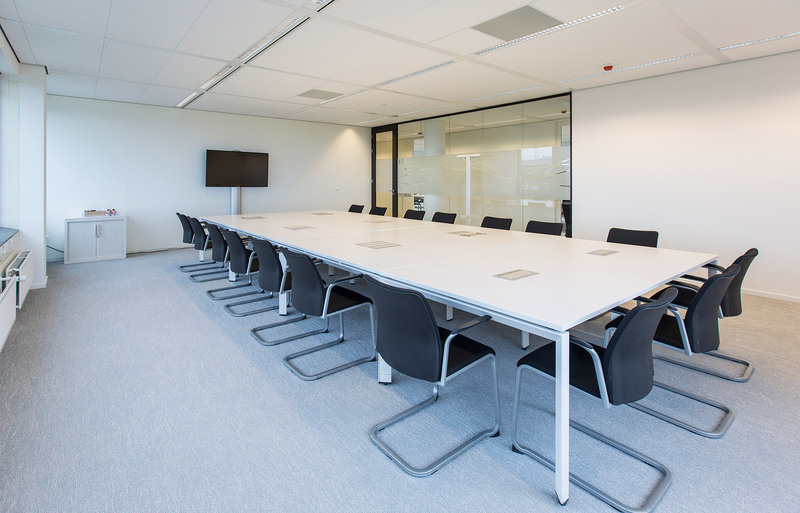 The meeting center on the first floor is equipped whit different kind of meeting facilities. 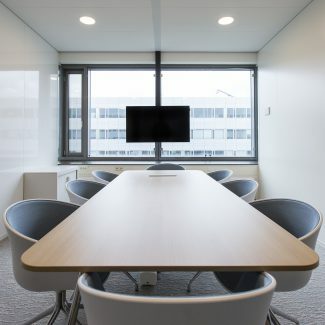 The showpiece is the boardroom with fifty places where each participant of the meeting has its own screen to follow the presentations. 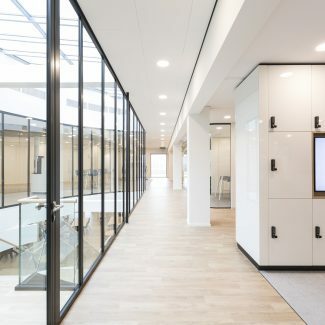 The meeting center has a thirteen meeting rooms with enough lockers where international colleagues can store their luggage. 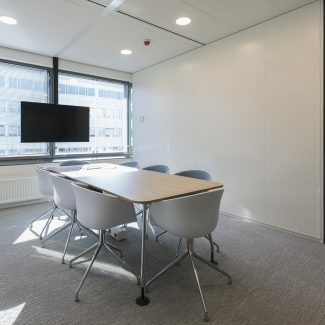 There are also seats for short consultation. 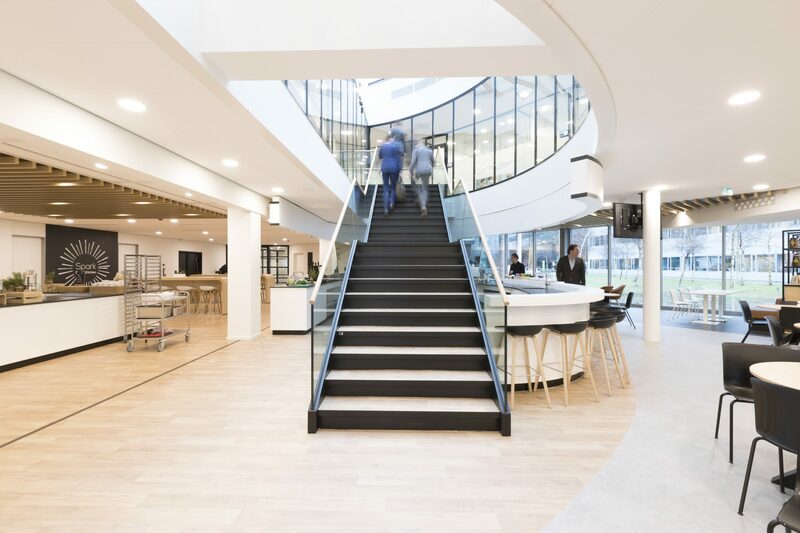 The meeting center is in direct contact with the restaurant just below the meeting center via an internal staircase. 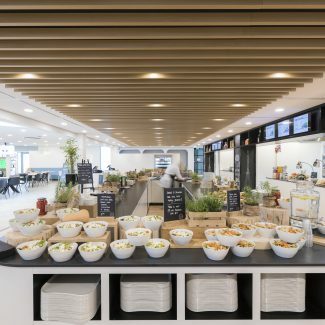 The restaurant has its own kitchen, coffee- and salad bar. 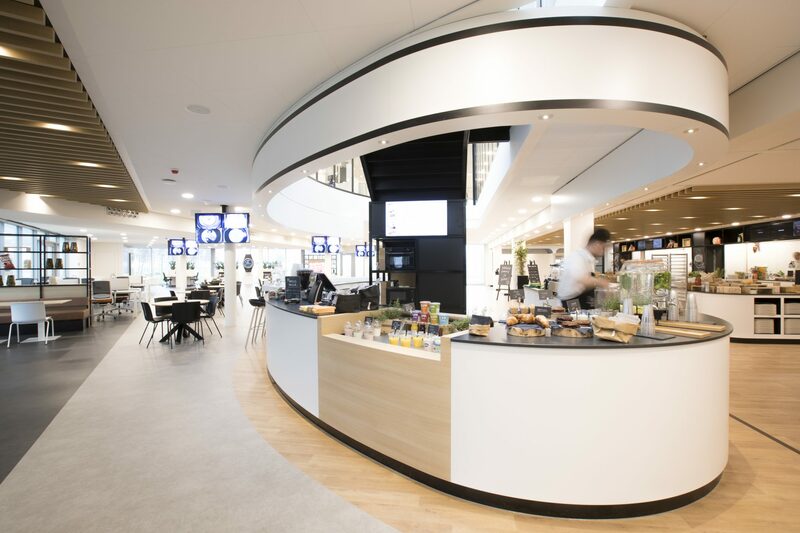 Every day the barista makes delicious cup of coffees, latte macchiato or an espresso for the employees and visitors of Samsung. 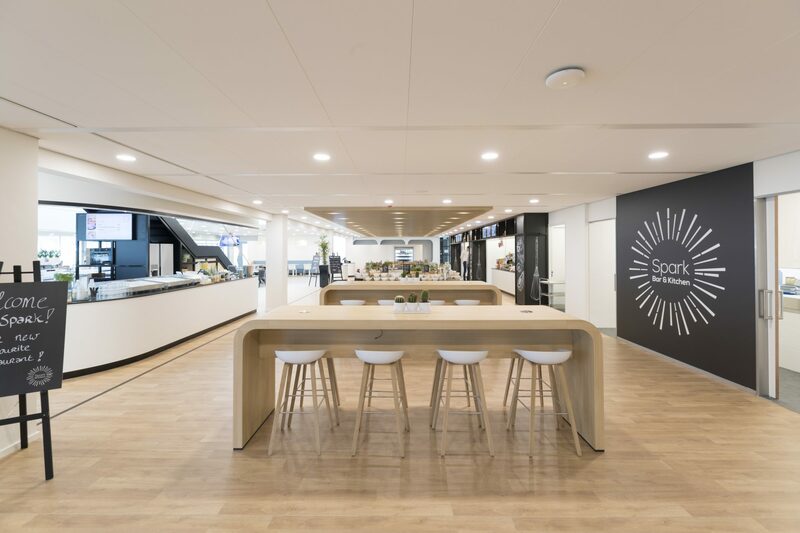 The restaurant also has a number of flex spots, experience center for Samsung products and a separate space for meetings and events. 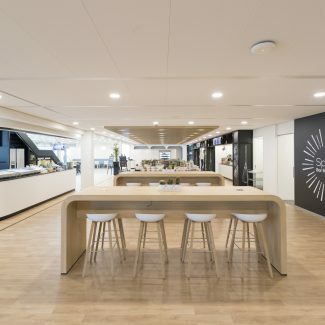 One of the main whishes of Samsung was to create a restaurant that is multipurpose. 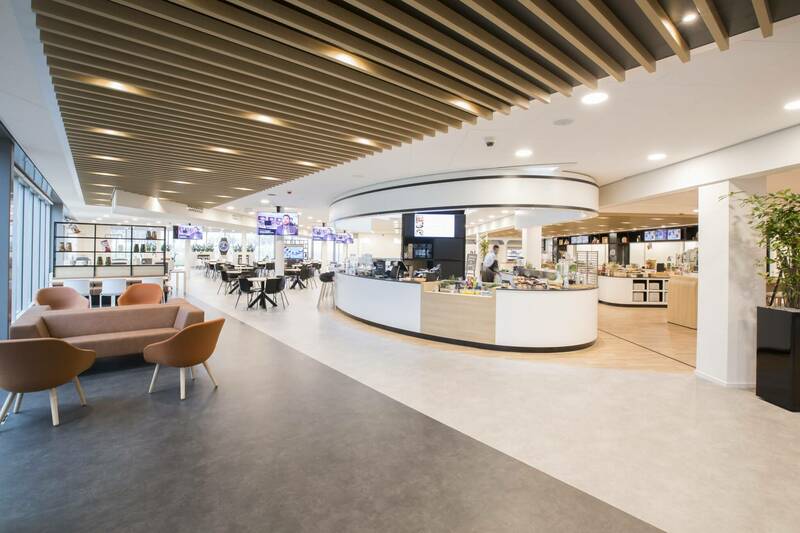 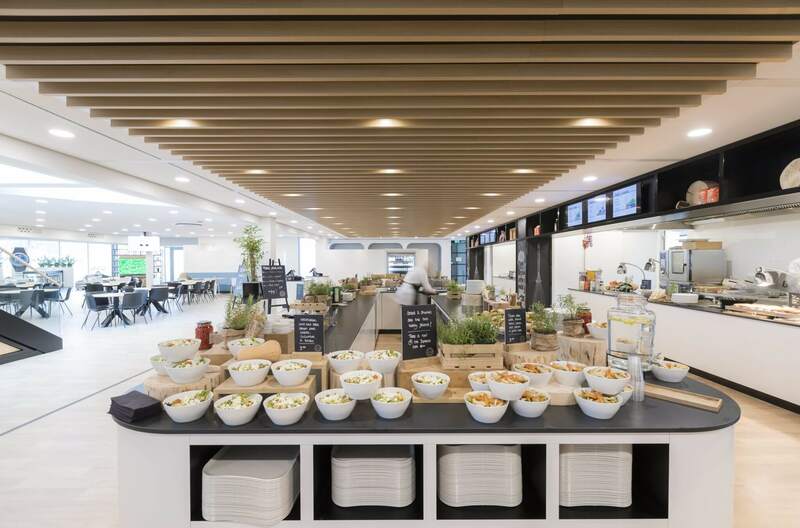 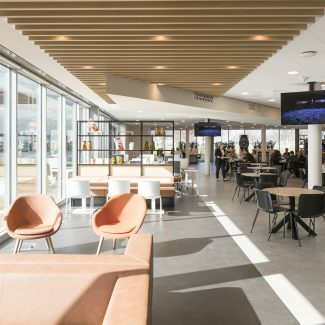 The restaurant is already being used for all staff meetings and the restaurant has really become a space where employees catch up with each other and where they receive their customers. 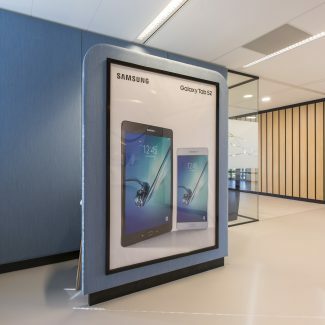 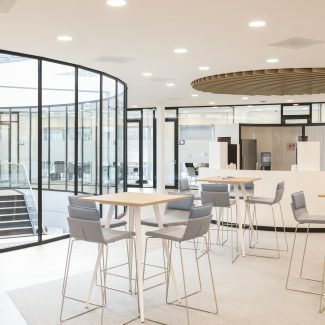 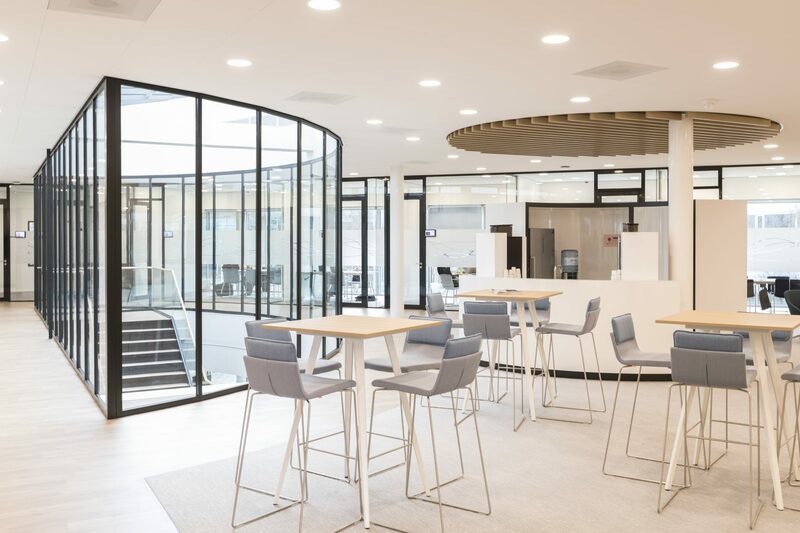 Tétris has constructed the new Samsung office in two phases. 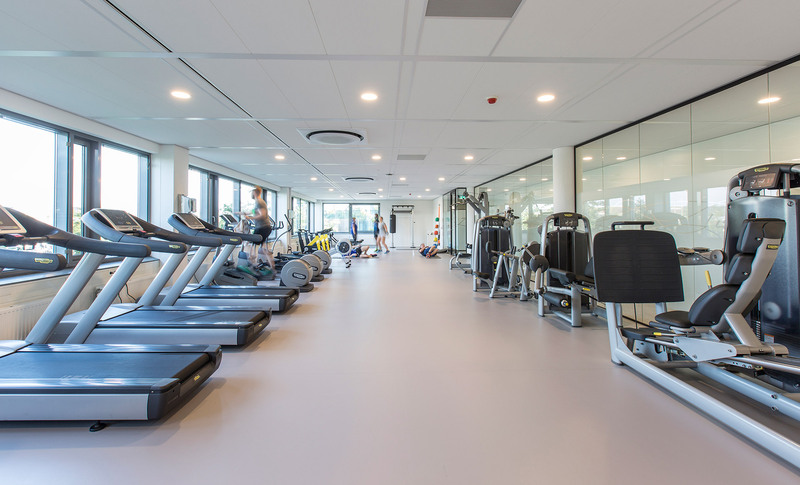 In the first phase we designed and constructed the separate floors. 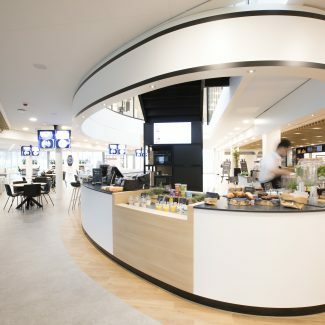 At the same time, we advised Samsung on the construction of the annex in which the restaurant and meeting center are located. 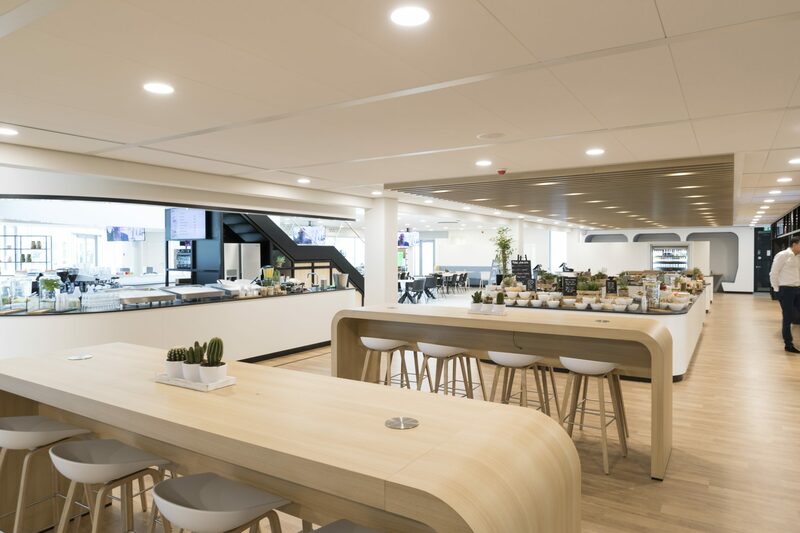 After the construction was completed we built the restaurant and the meeting center. 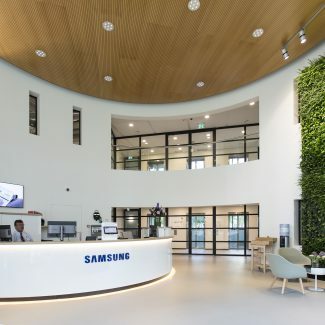 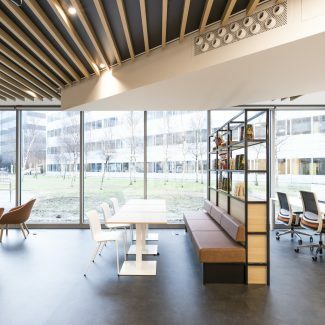 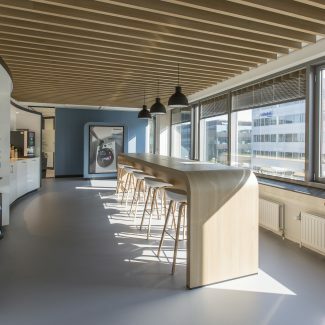 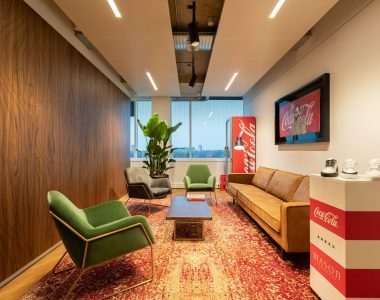 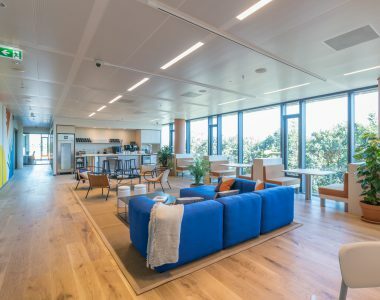 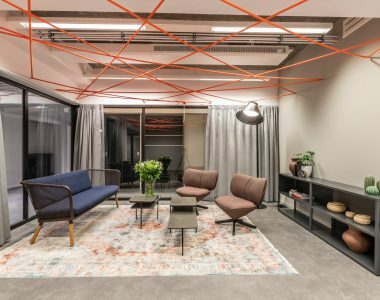 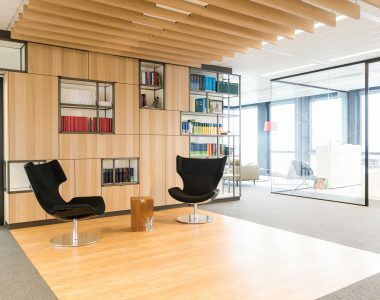 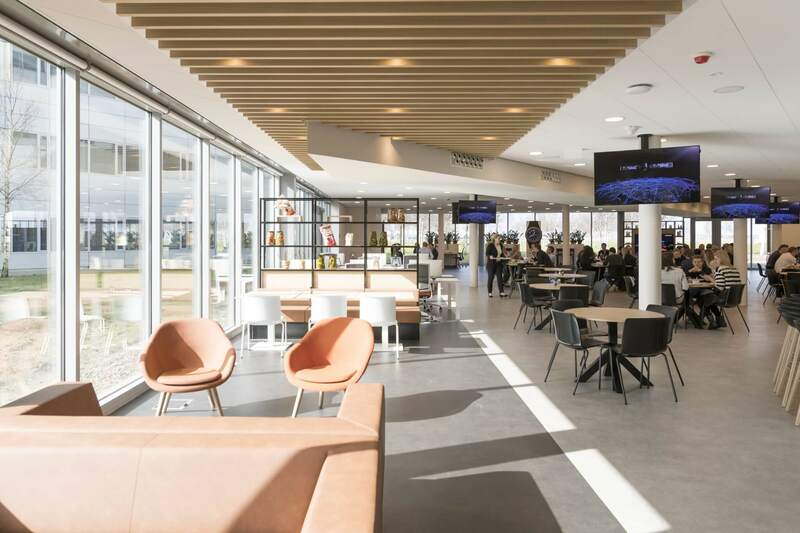 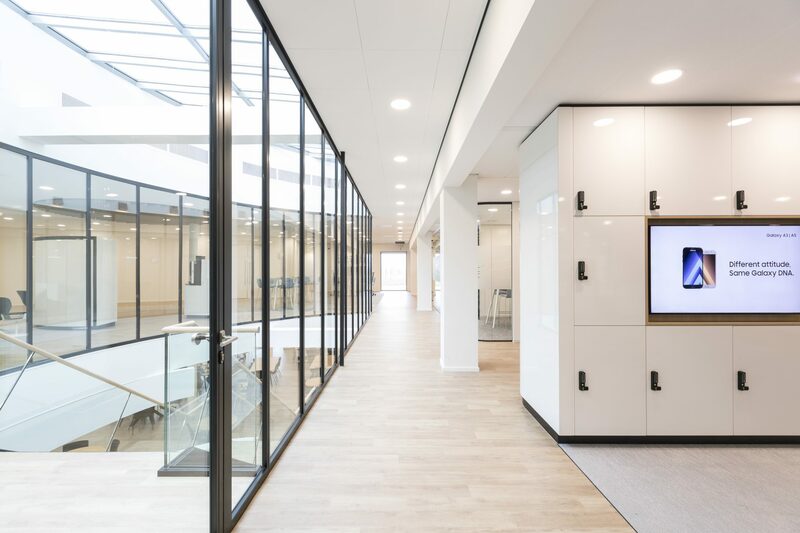 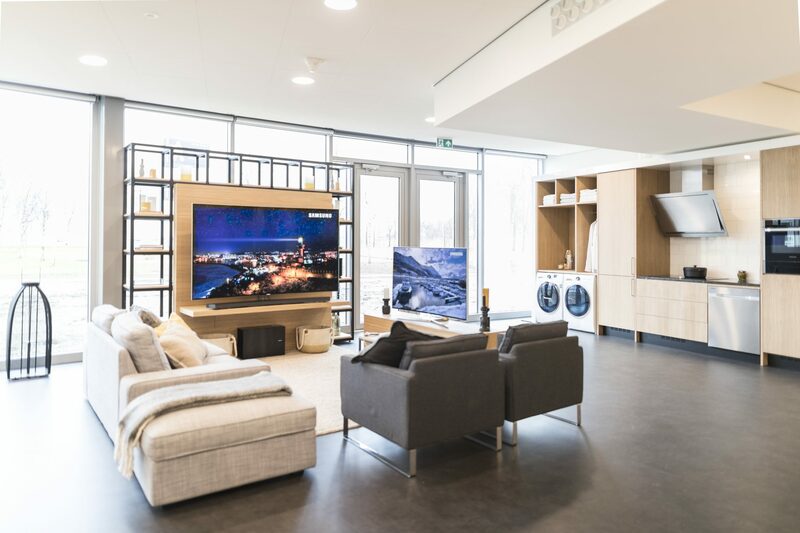 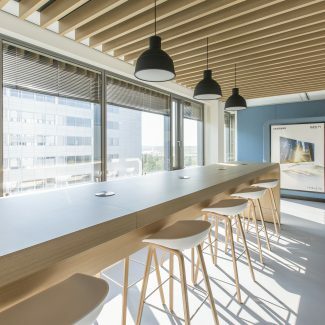 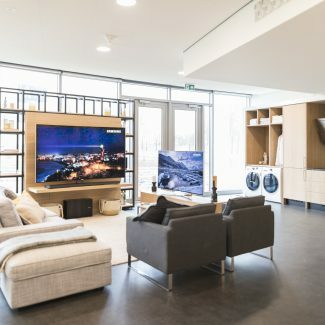 Because of the two phases the realization of Samsung’s new office was a long stretch, but in the end, Samsung is very pleased with the results and the office is now known as one of the best Samsung offices worldwide.